Stock photo of Large bulk carrier ship entering Lock 3 of the Welland Canals System at the St. Catharine's Museum, Welland Canals Centre, Great Lakes-St. Lawrence Seaway, St. Catharine's, Ontario, Canada. Large carrier ship has entered a dock at the Welland Canals System at the St. Catharine's Museum. 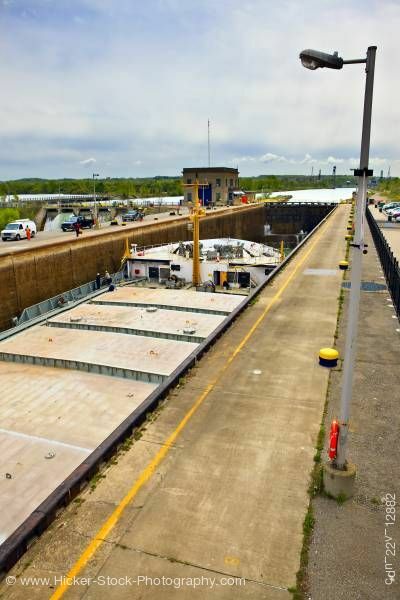 This stock photo shows a very long bulk carrier ship entering Lock 3 of the Welland Canals System at the St. Catharine's Museum, Welland Canals Centre, Great Lakes-St. Lawrence Seaway, St. Catharine's, Ontario, Canada. Long, large bulk carrier ship has entered a dock. Most of the ship’s surface is flat. The front of the ship sits higher with doors leading into the stem of the ship. A yellow tower stands just before the entrance to the front. The right side of the dock has a yellow line down the concrete that runs parallel with the concrete wall and several short yellow capped rope anchors spaced a few feet apart that sit to the left of the line. A metal lamp post sits in the foreground. The right side concrete wall, sits a brick building on top in the background. Large bulk carrier ship entering Lock 3 of the Welland Canals System at the St. Catharine's Museum, Welland Canals Centre, Great Lakes-St. Lawrence Seaway, St. Catharine's, Ontario, Canada.